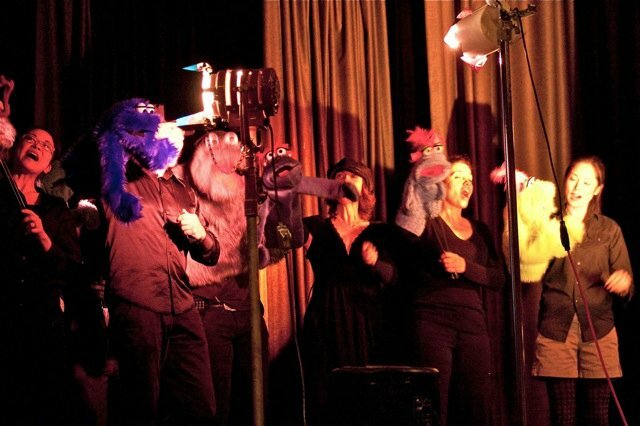 Last week, I went to It’s a Monster World, a new musical by Emmy Award-winning puppeteer Michael Earl and film maker Roberto Ferriera, and performed by Puppet School‘s advanced TV puppetry students. It was performed live in the North Hollywood Park Auditorium in front of a sold-out audience (of roughly 200, if I counted and did the multiplications right) and also shown on the public access channel (huh, those still exist?). 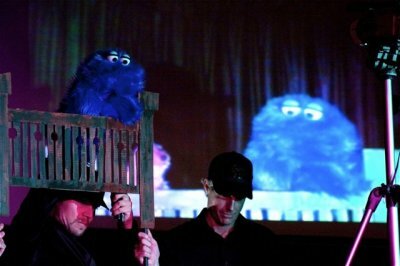 To give you a quick idea of what it was like, here’s a picture taken from Puppet School’s Facebook page. The show was sort of a hybrid of TV and stage puppetry. The puppeteers wore black but were visible. The main part of the action was defined by the camera frame and was projected onto the big screen, while there could be extras off camera as well. Consider a party. The main characters would be talking and you’d see them on the screen (the TV element), but on the side and in the back of the stage you got other party goers there as well (the stage element). Of course, there was that obligatory closing musical number at the end of every musical where the whole cast came out to sing together (See picture below). That part, was, of course, more stage-y. But really, in the cases of TV puppetry where the camera angle don’t change much and the character doesn’t actively play with the camera (like Elmo does), it’s a little like stage too. I don’t think there’s always a clear separation. The story took place in Monstertown, formerly Weaselville (something like that, I don’t remember the exact names). The town was populated by weasels but was later taken over by a bunch of rude monsters. A weasel girl sneaked into the Monster Ball in disguise with her monster friend, met this really nice weasel boy and fell in love. However, others discovered that she was not a monster and proceeded to try to catch her and throw her out. Ah, unlikely love between people from different groups that would not accept each other, what would musicals do without you? Anyway, later in a confrontation, it was revealed that the governor (or was it mayor?) was the one that was in love with the weasel girl’s grandma but that was a love that could not be because the two groups couldn’t accept each other. And he got bitter and angry, changed the town’s name to Monstertown, and forbade the two groups from mingling. But of course, grandma’s love melted his heart and he decided that we should all love one another like we used to and musical number ensued about how together we stood ten feet tall. The end. It was a nice story, and somewhat predictable too but not in a bad way (as in, you clearly knew who you were rooting for and you knew what they needed to do to pull it through, and guess what, they did, hooray!). I enjoyed the story, the jokes, the songs, and the references to other musicals and pop culture. But most of all, it was fun to watch 19 puppeteers perform at the same time. There is truly something magical about puppet shows, and all those people in the audience (adults who are likely kids at heart) could probably tell you that. And it was definitely a plus that several of the performers are my friends. That always makes things even more fun. If I am to be picky about anything from the show, I’d say that the audio wasn’t handled very well (understandable though for a venue like this). They needed to be more careful about the placement of the headsets, boom mic and monitors to prevent feedback. The lighting didn’t bring out the colors of the puppets very well, but on the other hand (okay, there’s potentially an unintended puppetry pun here somewhere), it was about a gloomy part of town. So maybe that was intended. And also, I kinda wish I had signed up for the class because it looked like a fun group of people with whom to work on a show. But hey, it was great to watch as well. The show was performed by Keiko Agena, Laura Barbera, Ben Bell, Rich Corbin, Jennifer Dohn, Michael Earl, Keith Ferguson, Tricia Gilfone, Andrew Hamilton, Heidi Hilliker, Chett Hoffman, Traci Kato-Kiriyama, Paddy Ja Lee, Jennifer Newfield, Heiko Obermöller, Minoo Rahbar, Jenny San Angel, Henry Watkins, and Dennis S. Wilkes. To see more pictures from the show, visit Puppet School’s It’s a Monster World photo album on Facebook, where I took these two pictures from. I checked the links you provided and it really seems to be a lot of fun to participate in one of those groups. It is nice to see that puppetry is alive and doing well. So, are you signing up for one of the next classes? Sounds like fun! Have a Merry Christmas! Michelle, I wish you a Merry Christmas as well! Puppets! Puppets everywhere! Like Murlocs, but less with the stabby-stabby and more with the cuddley-furry. Also, the pix remind me of the scene at the end of Forgetting Sarah Marshall where Jason Segal’s character puts on a puppet show. I was once out there trying to kill Murlocs, but I was not at a high enough level. So sometimes I would end up casting Intimidate on them and then run away. Alas, sometimes they will come back with more Murlocs. Damn humanoids. Speaking of Murlocs, you should totally look at this game, just because the different perspective is amusing. I always enjoy when you talk about puppetry:~) This show looked like fun, even though you could the people. I think in a way that might have made even more fun as you got to watch them move the puppets and make things work. Good to have you back, Sara! Yes, I am heading back to class and we’ll be learning about not one, but many kinds of puppets this time. Should be fun. Wheeeeee!